PID controllers have been widely used for control design due to their simplicities and non-model based design. However, they lack robustness with respect to uncertainties and external disturbances. 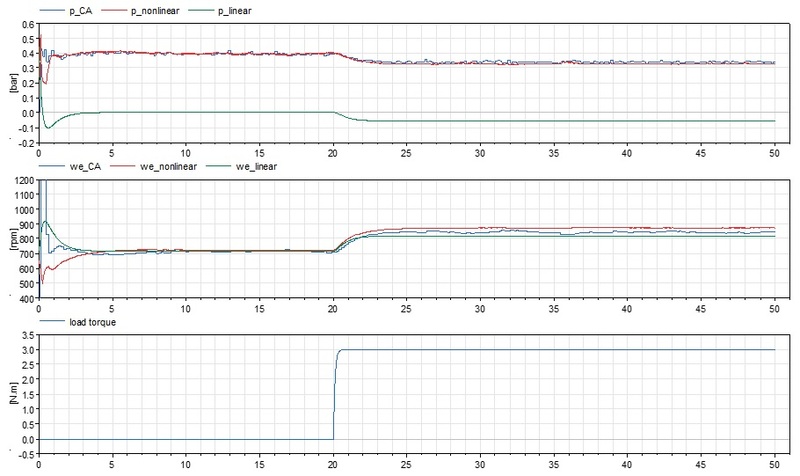 This blog post describes a method for developing a mean value model of intake manifold pressure and engine speed for model based idle controller design which can be applied to mean value and crank angle resolved engine models. This post shows the results of a mean value nonlinear model and compares these with the result of crank angle resolved engine model. A linearised model is then derived for controller design. Validation results show the derived nonlinear and linear model can accurately catch the dynamics of Dymola crank angle resolved engine model at the operating point at which linear model is derived. where is the open area, is the pressure upstream, is the ideal gas constant, is the temperature upstream, is the pressure downstream and is the air mass flow through the throttle. 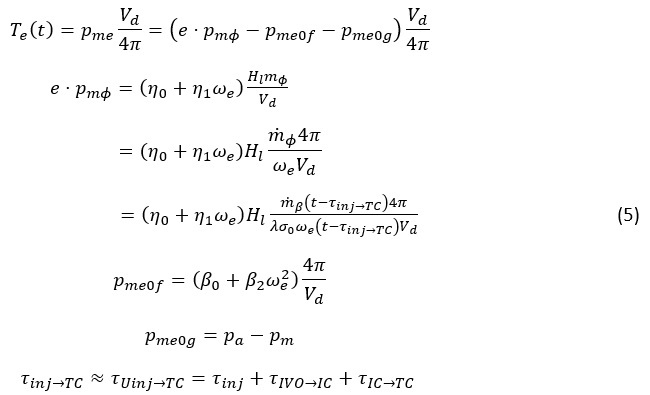 where is the manifold temperature, is the volume of intake manifold, and is the mass flow into cylinder. where is the exhaust manifold pressure and is clearance volume, and are tuning parameters. where is the brake mean effective pressure, is fuel mean effective pressure, i.e. brake mean effective pressure that an engine with an efficiency of 1 would produce with the fuel mass burnt per engine cycle, and are energy losses related to friction and gas exchange, represents the thermodynamic properties of the engine (related to indicated or inner mean pressure), heating energy of the fuel, mass of fuel, are tuning parameters and is transport delay approximated by . The following section will show validation of the nonlinear model (11) and linearised model (13) in simulation. For idle speed control we are interested in the engine speed around 700 to 800 rpm, in this case nonlinear model (11) is linearised around this operating point at 710 rpm. Tuning parameters are chosen as in (4) and for in (5). In Figure 1, below, results from crank angle resolved Dymola engine model, nonlinear model (11) and linear model (15) are compared. Throttle opening is kept at a constant angle and a step load torque is applied to the engine shaft at 20 seconds. Manifold pressure for crank angle resolved engine model and nonlinear model have similar behaviour before and after the disturbance. Pressure from linear model stays at its equilibrium before the disturbance and then deviates from its equilibrium because of step disturbance from load. Engine speeds from all three models have similar values before the disturbance with acceptable margin of difference after the occurrence of disturbances. nonlinear model (11) and linear model (15) with a constant throttle opening. Validation result shows dynamics of the engine at its linearised operating point can be accurately represented by its nonlinear and linear model. Model based controller design can then begin to be considered based on nonlinear or linear model. Next blog post will show a robust sliding model controller design and its result for engine idle speed control.
. L.Guzzella and C.H. Onder, Introduction to modeling and control of internal combustion engine systems, Springer-Verlag Berlin Heidelberg 2004.